February is here and a new month means new pizza and new beers coming your way! We’ve also recently restocked on merch from the crazy holiday season. Check out the restocked merch at the brewery or shop online for all your favorite IAC merch. Our second location in Santa Barbara is almost ready to open for you guys. Follow our SB Instagram account @Institutionales_SB for updates and news on our official opening date coming this month! This month’s specialty pizza is the Spicy Bacon Mac & Cheese Pizza! Loaded with creamy mac & cheese, smoked bacon, jalapenos, green onions and bread crumbs. Come try it for lunch and pair it with a pint of Restraint. Lockdowns only happen once a month and feature a special guest brewery and their favorite beers on tap at IAC. This month’s lockdown features our friends from Rincon Brewery. They'll be here on Wednesday, February 27th at 5pm to hang out and pour some of their favorite brews on tap at IAC. The event starts at 5pm but come by anytime until closing. Don’t miss out on this one night only event, and check back soon for more details! Clarity returns to IAC! An easy-drinking golden ale generously dry hopped with Mosaic, Nugget and Warrior hops. Low bitterness and a clean finish make this one of our most approachable beers. For our 400th Batch at our Mission Oaks location, we brewed a refreshing Pale Ale with a heavy dose of Citra & Mosaic Cryo Hops. These hops are extremely fruit forward with flavors of citrus zest and blueberries. Our new pale ale, State St., with jalapenos! The peppers add the aroma and flavor of fresh cut jalapenos with minimal spiciness. This is a super small batch, so grab some while it’s around. Our newest IPA recipe, Light Up Your Torch, showcases Citra hops with a little bit of Cascade and Mosaic in the background. This IPA is super citrusy and juicy with medium bitterness. Be on the lookout for four packs as well! Three of our favorite hops are highlighted in this West Coast Double IPA. Mosaic, Citra and Simcoe combine for intense flavors of tropical fruit, lime and resinous pine. Orchards To The Sky is brewed with only base malt to let the hops dominate from the initial aroma to the final lingering bitterness. The Surgeon is our annually released Triple IPA, checking in at 10.6%, 80 IBUs and nearly 8 lbs of hops per barrel. This massive IPA is loaded with Mosaic, Simcoe, Columbus, Centennial and Amarillo hops. Enjoy this dank, fruity, and intense Triple IPA that only comes around once a year! Be on the look out for four packs in late February. 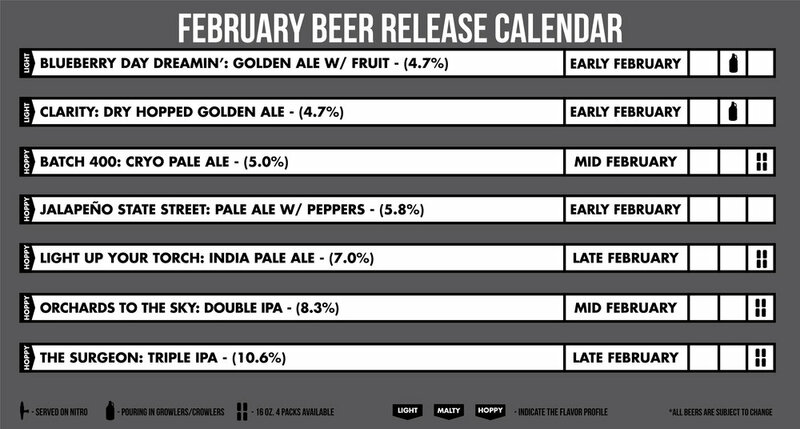 Here's what's on tap currently in the tasting room as of February 1st. Visit www.institutionales.com/on-tap/ anytime for a daily and most up to date tap list. Lockdown: Featuring Rincon Brewery (Wednesday, February 27th): This month’s lockdown will be featuring our friends from Rincon brewery! Join us at the brewery on February 27th and come hang with the Rincon Brewery crew and try some of their favorite beers at IAC! More details to come.